Esta infografía expone los hallazgos más alarmantes presentados en el reporte conducido por Safe Kids Worldwide, y con el apoyo de FedEx, acerca de los peligros que existen en las zonas escolares. La información incluye las distracciones que afectan a los peatones y datos acerca del comportamiento de los conductores. This is an infographic that breaks down findings from a new research report, “Alarming Dangers in School Zones,” done by Safe Kids Worldwide with support from FedEx. 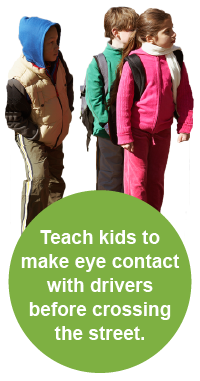 It covers texting while walking and other distractions and well as driver behavior. This infographic highlights seven ways children are getting hit, paired with seven tips to prevent them from happening, in Spanish. This infographic highlights seven ways children are getting hit, paired with seven tips to prevent them from happening, in Russian. This infographic highlights seven ways children are getting hit, paired with seven tips to prevent them from happening, in Portuguese. This infographic highlights seven ways children are getting hit, paired with seven tips to prevent them from happening, in Chinese. This infographic highlights seven ways children are getting hit, paired with seven tips to prevent them from happening, in Arabic. This infographic shows 7 ways how not to get hit by a car. Be safe and be seen this Halloween. Our new infographic shows you how to walk safely.